Hello again, I’m back with another card using the Victorian Original Bird Cages stamp. Have y’all had enough of this stamp yet? I haven’t, I just can’t get enough of it. It’s pretty but simple at the same time, therefore there is so many things you can make with this stamp set. You can’t tell by looking at it but I got nice and messy with some Tim Holtz inks making this one, and had fun while doing it. To start, I rubbed my Tim Holtz Candy Apple distress ink pad all over a piece of Neenah solar white cardstock, and then use the blending tool to smooth out the color. After the ink dried I spritz it with some water and anded water droplets. I let the water sit for a few seconds then dab it up with a paper towel. To create the script pattern in the background I used the “Mini Believe Script” stencil by The Crafters Workshop and blended Mermaid Lagoon Distress Oxide over it with a round blending tool. *Note to self, oxide inks stain horribly so try not to get it all over your fingers. After that, using a palette knife I mixed Tim Holtz texture paste with some Mermaid Lagoon distress oxide on in acrylic block then spread the mixture over the My Treasured Kutz “Roses” stencil. After my texture paste dried I cut a rectangle out of my mixed media panel using my Sizzix BIGkick and a rectangle stitched die. Then, nesting together to stitched rectangle dies, one of which was used to cut out the rectangle window, I created a frame to go around my window. Ok, so the Bird Cages stamp is actually one stamp with four different bird cages lined up on it. For this card I decided to cut the bird cagesapart, which is fine because that gives me more options to use them; as I did with this card. 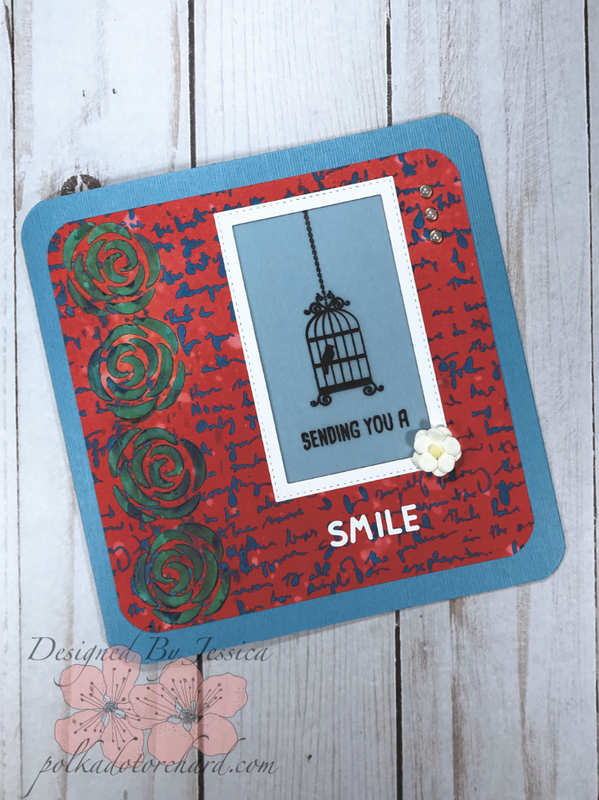 Using my Tim Holtz stamp platform I stamped The Birdcage with Stazon ink on some scrap vellum and then stamped the stamp “SENDING YOU A” right under the bird cage. That stamp is from the Honey Bee Stamp set “Smile”. Once the ink was completely dry I atg taped all sides of my stamped vellum and attached it behind the window. I then stuck the panel to my DCWV blue card base. To finish up the front I punched out the word “Smile” with alphabet letter punches, ran them through my Xyron sticker maker, and adhered them to my card panel right below my window frame. I added one flower from I Am Roses to the bottom corner of the frame. I tried to add more flowers but it was too much, just one flower was perfect. My last finishing touch was to add the gold edged flat back pearls to the top corner. Now, onto the inside. 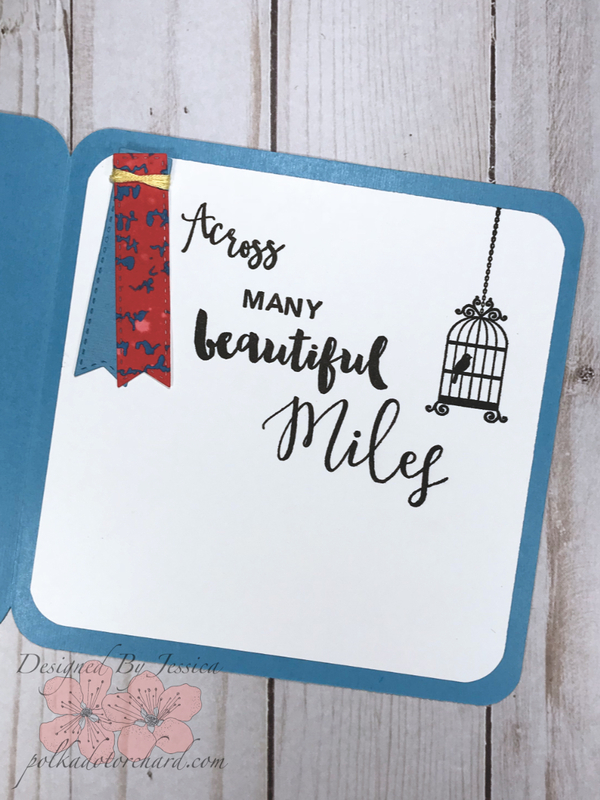 I actually used 3 stamp sets to create the sentiment “Across MANY beautiful Miles” (sets listed below) I love how the mix of fonts and sizes look together. I also added the bird cage to the inside. Then finishing it off by tying together some stitched banners that we’re cut using a metal die and paper scraps left over from the card front. The entire card it reads as this “Sending you a smile across many beautiful miles”. That sounds so nice, right? That is what I love about theses “build a stamps” you can stamp stamp any saying you’d like. I’ve recently got the the Honey Bee stamps and Concord & 9th stamps, they are one of the best crafty purchase I have made; I’m not quite sure how I made it this long without them, lol. Gorgeous! I love how you used the stamp on the inside, too. 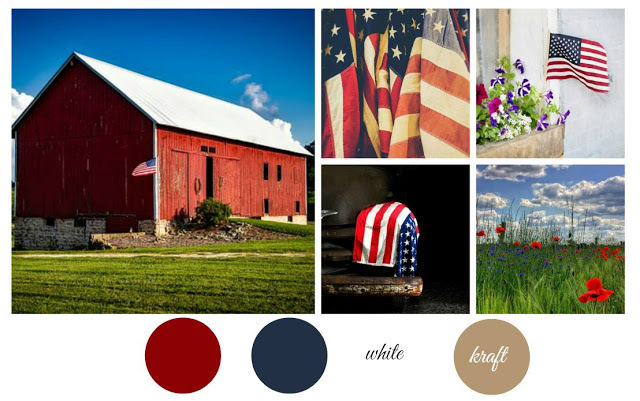 So glad you are going us for the mood board challenges. Look forward to seeing more of your wonderful cards. This is just precious. I adore that stamped bird cage. It’s so elegant. Thank you for joining us for Simon Says Stamp’s more than one stamp challenge! Good Luck!